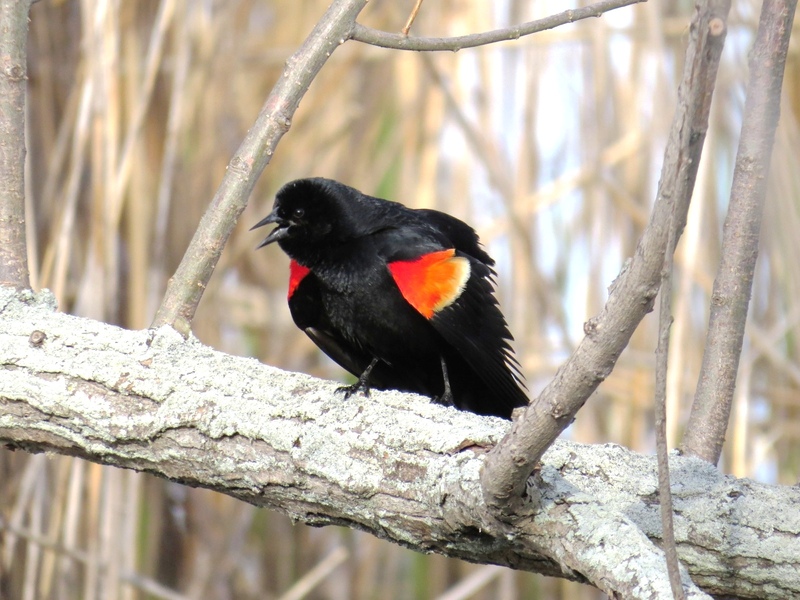 This is the time of year when Red-winged Blackbirds are returning to marshes all over the continent, and the males are performing their showy displays to impress females and intimidate rivals. You might think the display simply involves fluffing up the body feathers and especially the red patches on the wings, but there is a lot more going on. I took these photos in May 2014 at Pelee Island, Ontario, and they work well to show the directional component of the display. 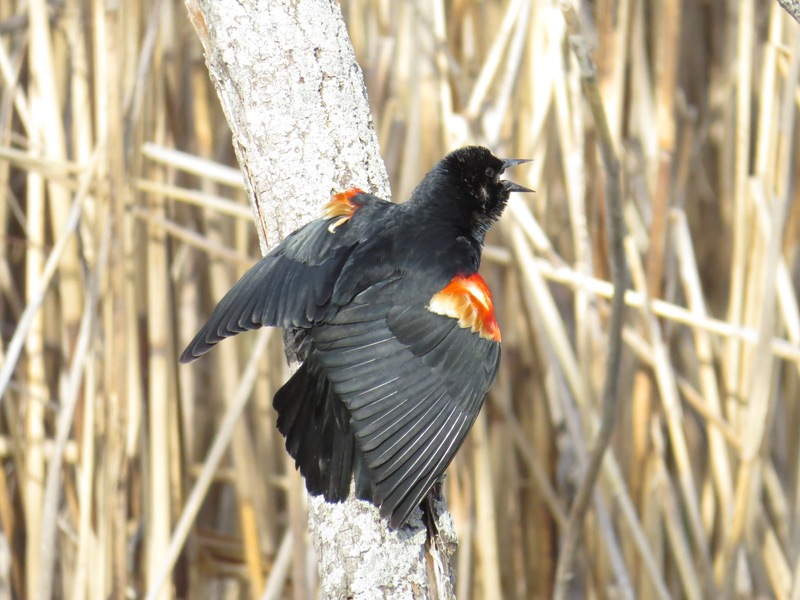 When a male Red-winged Blackbird sings it fluffs up all of its feathers, spreads its wings slightly, lowers its head, and “hunches” its shoulders to show them off to full advantage. The best show is from the front of the bird. Seen from behind or above, the display is still impressive but lacks the extremes of color that show from the front. The sheen of the back and wings is not really black, and because we are looking at the red wing coverts from behind we see down into the whitish bases of the raised feathers. Viewed from the front, the red wing coverts have been pushed up to face us so that we see their flat red surface in full glory. The slightly spread wings, arched neck, and spread tail angled down all combine to create a solid and deep black that accentuates the brilliant red patches. Knowing something like this is interesting on its own, but it can also help you find other birds. It’s a safe bet that the male has positioned himself to show off his best side, and looking in that direction may reveal the object of his attention. I am curious about the wing markings. For the first time this year I have been seeing the males with only a smaller yellow band, rather than the yellow and red. I have seen several so decided that maybe the band develops over time, with the yellow preceding the red. Is this the case, or are these birds just different? Hi Marianne, As Marie says (thanks Marie), the males only show the red patch in display, and most of the time it is covered up with only part of the yellow-white band visible. Another possibility is that you are seeing one-year-old males, which have a drabber red patch and sometimes mostly black, but still a fairly prominent pale yellowish band. The one-year-olds should still show a lot of rust and buff brown streaking and edging on the body and wing coverts, not uniform black like the adult males, and are generally easy to age by that. David in your app guide you show an illustration for ‘first summer’ male RWBB – do you mean 1-3 years after hatching, or the following summer? Hi Mike, In that sense “first-summer” means a bird about one year old (a “first-year” bird), finishing its first year of life, and following “first-winter”. I just saw a female at our feeder! She was pretty; with more of a rusty-orange glow. I know these birds well from NM but, it’s a first that I’ve seen Red-Winged Blackbird here in Las Vegas, NV. Marianne, The males you’re seeing are likely not displaying? Correct? The true multi-colored appearance of the wing patches is best visible during a display. When the male is in a non-territorial situation, such as feeding in a group, he keeps most of the wing patch covered by black feathers, so only the yellowish part is visible. 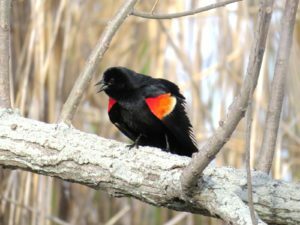 I have a redwing blackbird at my feeder that looks like a female but has red on shoulder.I have been birding for a long time but have never seen one like it. Have you? Hi Mike, That’s probably a female. They can show some red on the shoulder. The other possibility is a very female-like 1st-year male. In that case I would expect it to show darker plumage overall than a typical female, and it would be the same size as the other males (distinctly larger than a female).